What did you have for breakfast this morning? Pumpkin-something from Starbucks? If you’re a pumpkin lover and this is your most favoritest food time of the year, then I have some good news for you today. 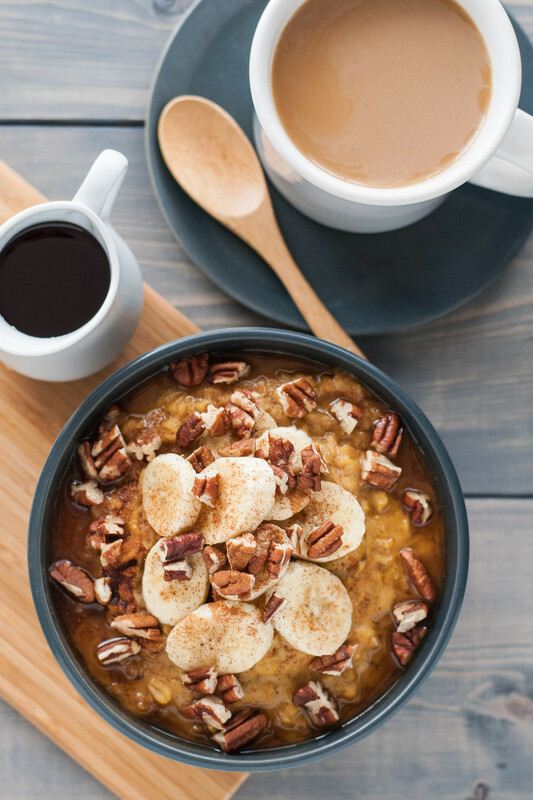 An easy, inexpensive, homemade, quick, plant-based, warm, pumpkin breakfast. I’ll admit, stopping at Starbucks is a nice, cozy, familiar ritual for some of us. I’ve broken the habit of going every day as I’ve moved away from drinking cow’s milk and consuming lots of processed, sugary foods, but something about stopping in on the last half of my walk for a little Americano action this morning is comforting. Or maybe it’s the fact that it will be my only human interaction for the next eight hours…either way. 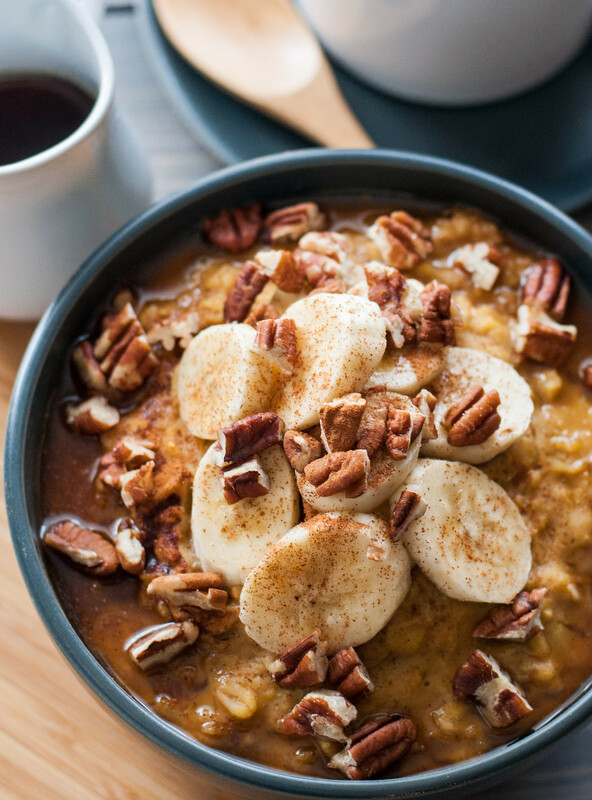 What I’m trying to say is, take your coffee however or wherever you like it–you’ll still have time to whip up these tasty oats for breakfast, and double your pumpkin intake before 9 am, if that’s your goal. It’s a really simple recipe–the kind that is never at the forefront of my “to blog” list, and yet it’s probably on the top of the list of internet recipes you’ll actually make. Which, by the way, is my goal–posting plenty of recipes that are accessible when you’re short on time. Believe it or not, I had to repeatedly look up the recipe for cooking rolled oats when I started eating them regularly this year, but once I got the basic formula down, I started to play with finding my favorite toppings and mix-ins to keep things exciting. While I despise spongey pumpkin pie and pumpkin spice lattes (gasp), I’m a fan of pumpkin-y baked goods and pumpkin smoothies (basically, this recipe in frozen format). During some weird, overnight weather shift from tropical to frigid, I had pumpkin puree in the fridge but was not about to sip on an icy smoothie on a 40 degree morning. And there we have it–pumpkin sun butter oatmeal was born! Sun butter (sunflower seed butter) didn’t make it into the name of the recipe, but it’s crucial to the texture. 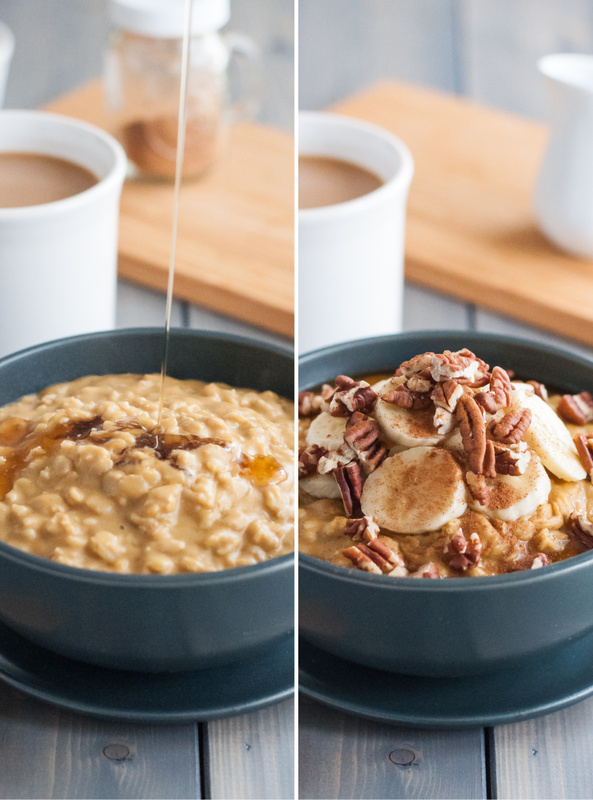 By mixing that, as well as the pumpkin, into the oats right after they’re done cooking, both those additions heat up and create a vibrant fall oatmeal with a silky smooth appearance and finish. To keep the fall theme going, I add pretty stereotypical, but always yummy, pumpkin pairings–maple for sweetness, cinnamon for depth and warmth, and toasted pecans or walnuts for some crunch. Sliced bananas aren’t essential, but I like the soft texture and freshness that raw fruit adds. I’m guessing some chopped or previously baked apples would have the same effect, but I can never get motivated to make cooked apples ahead of time for breakfasts. The recipe serves one, but it can be multiplied easily. If you suspect you won’t be able to use the whole can of pumpkin, I like to put it in an ice cube tray, cover with plastic wrap, and freeze to use in smoothies. When I tested the recipe for the photos, I made a double batch, so I experimented with storing the finished oatmeal overnight. Unfortunately, it loses its creaminess and the oats absorb too much liquid for me to recommend making it ahead (it was just slightly better than “edible”), but you might try the same pumpkin/sun butter combo with steel cut oats (not typically gluten-free), which keep much better in the fridge for your whole work week. To keep it gluten-free, be sure to buy gluten-free rolled oats, and none of those quick oats! Really, are quick oats any faster than 5 minute rolled oats? They must be lightning-speed oats. I get my oats in the bulk bins at Whole Foods, for which I will preach endlessly–way cheaper, especially for an organic product, and you can buy as little or as much as you need. As the week gets rolling, I have to mention what I had for dinner last night. I made the warm cauliflower “cous cous” salad recipe by Green Kitchen Stories, and man, did it hit the spot. I needed a solid veg (um, okay, plus some cheese) dinner in the mix of all this rich food we’ve been eating. You run cauliflower through the food processor to turn it into cous cous sized pieces, then blanch it to soften. While it’s still warm, it gets mixed with fresh parsley and basil, olive oil, lemon juice, seasoning, peas, toasted pumpkin seeds, and crumbled feta. Even though I used a whole head of cauliflower, the quantities were actually perfect to make it an entree salad for two. GKS has such a knack for simple, surprising combinations–I love their recipes (see my Pinterest for others) and am envious of her cooking talent! 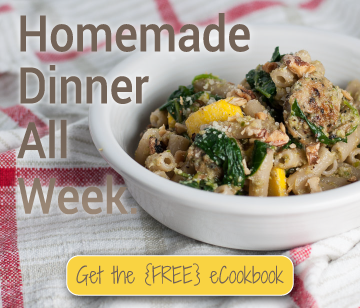 I come back to their site time and time again when I feel the need to reset the cooking craziness and get back to the basics for therapy and the art of creating something for people you love. Awwww. Seriously, though, check them out. Final non-sponsored plug–it doesn’t hurt that their children are little cherubs and David’s photography is RIDICULOUS. Stunningly simple, just like the food. I’m loving this non-regularly scheduled Tuesday post (because I have a regular schedule? No.) with a simple recipe, so I have some room to tell you about other things happening in the kitchen and in life! Wasn’t that the original purpose of blogs? I guess I’ll just have to go all old-school and keep it that way. 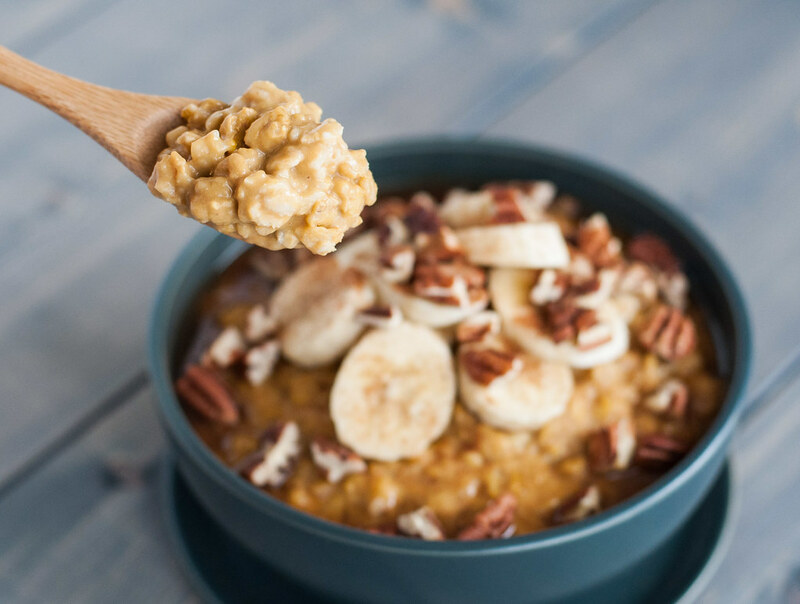 This oatmeal is one of my go-to breakfasts no matter what the season. 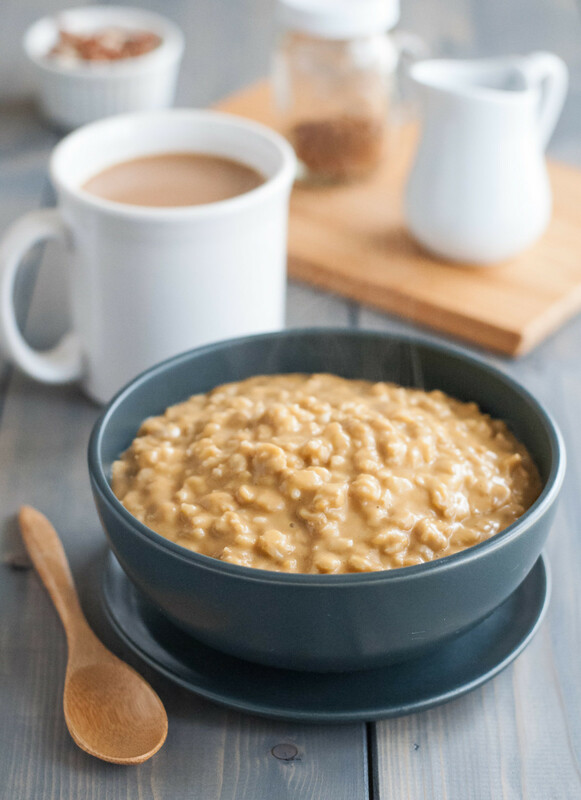 Sun butter and pumpkin are mixed into piping hot oats to make them super silky and rich, and you can top it with whatever spices, fruit, nuts, or power foods are in the pantry. In a small saucepan, combine oats, milk, water, and salt. Bring to a boil, then reduce heat and simmer uncovered until thickened, about 5 minutes. When cooked, remove from heat and stir in sun butter and pumpkin puree right away so they melt into the oats. Mix in or top with remaining ingredients. I made this recipe on a cool fall morning and it was so amazing that I made it again the next day. A recipe I’ll keep going back to. Thanks!!! Love it! It’s so perfect for the fall weather. This was delicious. Definitely a new breakfast favorite!! Do you have the nutrition information for the recipe? Thanks! I’m going to omit the water and add more almond milk, maybe chocolate milk.